This is a very minor neighborhood street. It doesn't carry a lot of traffic, nor does it need to. For most urban streets, this is a good model. However, there always has been and always will be a need for major streets, too. Most suburban areas suffer from a lack of an interconnected street network. By perpetuating a street pattern riddled with long blocks and cul-de-sacs, we have forced nearly every suburban auto trip out to the major streets, jamming them up with ridiculous congestion. To demonstrate an extreme example of this syndrome, someone found two homes in Florida that share a backyard fence, and yet to drive from one to the other requires a 7 mile drive! With an interconnected network, people can make more direct trips, often avoiding major streets entirely. But even if suburban street networks had better connectivity, they would still need some major streets. There always has been some streets that are bigger than the rest. People going across town need streets that will carry them there. While we have unnecesarily pushed to many trips out the major street network, we also don't want huge volumes of traffic rushing through small neighborhood streets. Even if we're successful in boosting transit ridership, biking, and walking, and we're able to shorten as many of the remaining car trips as possible, we're going to need major streets. First, we need to get the land uses right. It should be pretty apparent that single-family homes do not like being on major streets. The American Dream of single-family home living does not really coincide with the atmosphere of a busy thoroughfare. 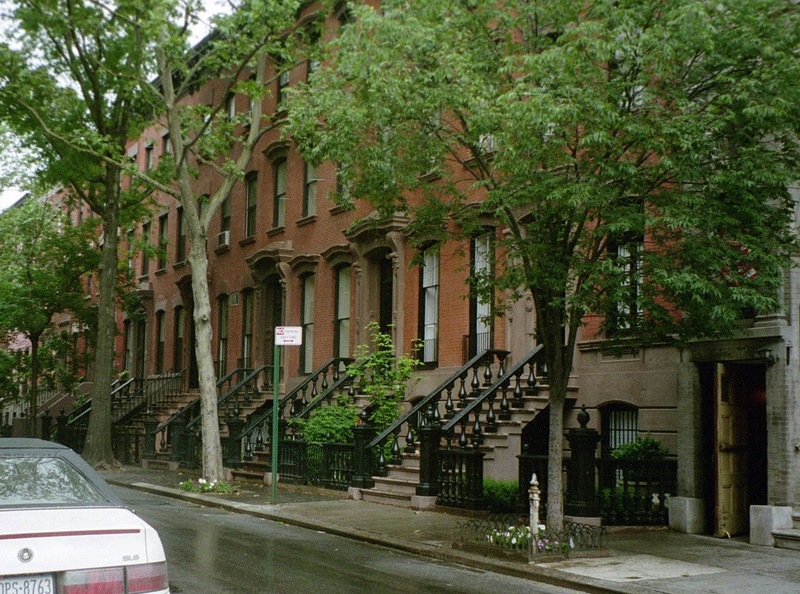 Homes along major streets are often valued lower than similar homes a few blocks away. Often, maintenance is worse on homes on major streets, or tall fences and hedges are deployed in a desperate attempt to shield the inhabitants from the noise. Newer subdivisions almost always turn the homes completely away from the street, creating stretches of hundreds or sometimes thousands of feet of masonry block walls. When it is possible, don't put single-family homes on major streets. 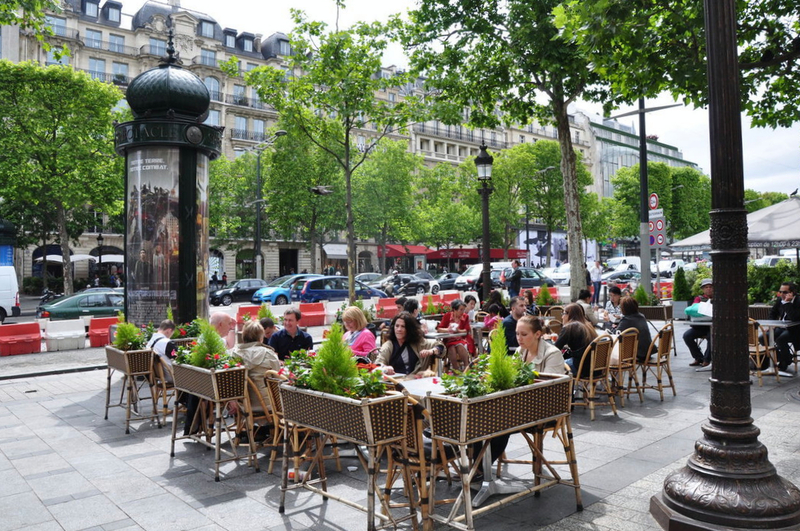 Whenever possible, land uses along major streets should consist of apartments, services, hotels, and offices. The commercial uses will benefit from the visibility to the traffic, and apartment dwellers are typically much less fussy about noise and appreciate the access to services and transit. At major intersections, retail should also be a part of the mix. I consider myself a faithful New Urbanist, but it is fair to say that retail often isn't New Urbanism's strong point. A large share of the blame for this lies in the impulse to place the retail away form the major street on a narrow, comfortable, quiet street. It doesn't usually work. Retail thrives on traffic... foot traffic, bike traffic, transit traffic, and auto traffic. Commerce has always sprung up at busy crossroads. Why fight this? Let's use it to our advantage and just make the big streets nice. Arlington, Virginia understood this. At great expense, they put their Metro line for the Ballston-Roslyn corridor in a tunnel below a major street, and made that street the focus of its housing, office, and retail growth. It has worked fabulously. Contrast their experience to the failed traffic bypass schemes of the 1960s. These plans drew traffic away from downtown retail streets, which were often completely pedestrianized. These cures very often killed the patients. 2. Building / Site Design. In a nutshell, don't create tunnels by turning the backside of development towards the street, and don't create harsh voids by setting buildings hundreds of feet back. Buildings must face the street, and present pleasant architecture, windows, and doors to it, and they should be built right up to the back of the sidewalk. This helps to make it a place where people will be willing to walk, and by creating "eyes on the street" it will be safe for them to do so. Buildings with ground-floor residential units should provide a bit of privacy for the units along the sidewalk by elevating the ground floor by 4 to 6 feet. Units along the street should have individual entrances directly to the sidewalk, accessed via stoops or porches. Buildings with ground floor office or retail uses should be accessed via storefronts. Transitions from the higher densities on the major streets and the lower density neighborhoods that may be nearby are very important. Building heights should be highest along the major streets, and should step down toward the adjacent residential areas. This makes practical sense; place the most people next to the most amenities. It is also a political necessity; to avoid opposition from concerned neighbors, you'll need to assure them that the impact on the character of their streets will be minimal. Don't worry about creating "canyons." A form-based code which creates the right building forms and frontages will make sure that the tall buildings along the major street feels comfortable. Graceful transitions are essential when urbanizing a major street. 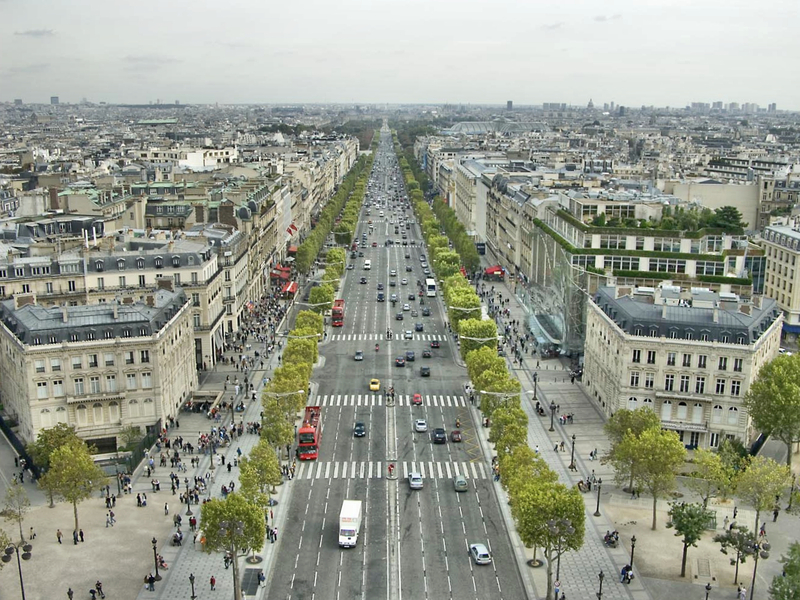 Most major streets have been so geared up for cars that they don't work for any other purpose. Cars need to be put in check a bit in order to make room for other types of transportation. Major streets must serve more than one transportation function. Moving people should be the primary goal, not just moving cars, which isn't always the same thing. For example, in 1907 the Brooklyn Bridge moved 426,000 people per day. These folks were on foot, in street cars, and in autos. Today, as an auto-dominated bridge, it only moves 176,000 people, far fewer than in its multimodal heyday. Major streets need to move a lot of people, however they might be getting around. Bike lanes should be a part of the equation. Consider protected lanes when space permits. Sidewalks need to be ample; 12 feet should be considered the absolute minimum, and 18 feet is better if it fits. 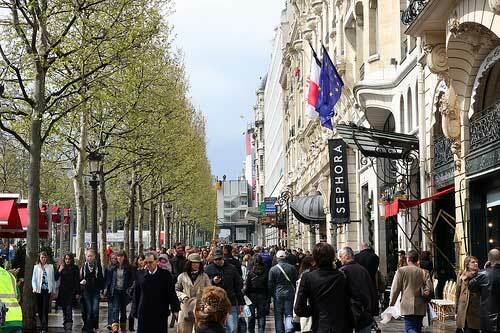 The sidewalks need to be equipped with pedestrian scale lighting, and street trees should be large and limbed up above the retail signage level (12 to 15 feet high). On-street parking is a must-have item, so find a way to squeeze it in. It helps retailers, and more importantly, it provides a physical barrier between pedestrians and traffic. While it has been overemphasized, moving cars is still important; where else will they go? However, traffic engineers have been too focused on speed. Narrowing lanes can slow traffic without hurting the road's capacity. In fact, because drivers space themselves out as they go faster, a road usually carries the highest number of cars at 30 to 35 miles per hour, which is a speed very compatible with creating a nice place. Controlled intersection spacing is of critical importance, and is often neglected. The block increment of 200 to 500 feet that makes street networks walkable in general must be respected on major streets. Often, especially in older areas, there are minor streets intersecting the major street at frequent intervals, but don't let the map fool you. If there isn't a traffic signal and crosswalks, there is no intersection in the practical sense. Intersections with signals and crosswalks, meaning one can cross safely and legally, are often placed more than 1,500 feet apart in order to facilitate traffic flow. A 20-foot high wall with barbed wire would only be slightly more effective at creating a barrier. The GIF below shows how improvements in land use, site and building design, and street design can transform a bleak place into a nice place. An excellent example in my neck of the woods is King Street in San Francisco. It moves a lot of traffic, transit riders, bike riders, and pedestrians. Before getting its makeover, it was the site of railroad tracks and abandoned warehouses. 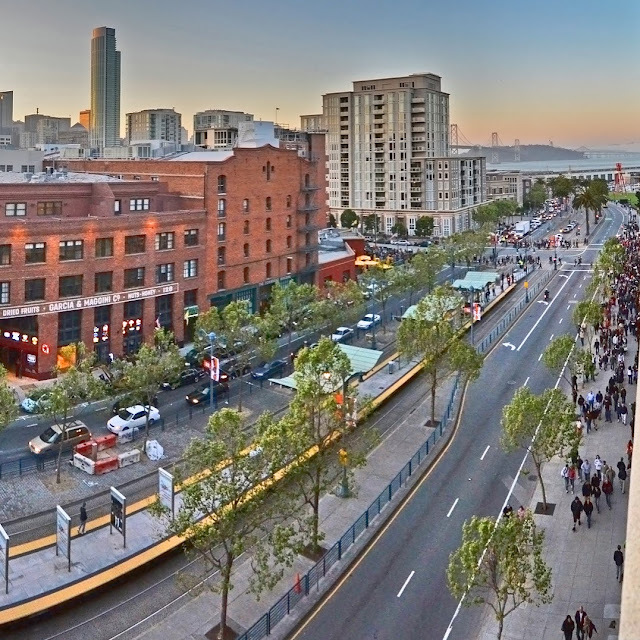 Since the year 2000, this dynamic major street, along with the AT&T Park baseball stadium, has become an impressive catalyst for development. Also, it is a nice place. It carries a lot of cars, and is a nice place, too. For a more dramatic example, look to Paris. Its boulevards move tremendous numbers of cars, and yet they are such nice places that the adjacent real estate is some of the most valuable in the city. This needs to be the model for the major streets of America. It carries an insane amount of cars, and is one of the greatest places in the world. Housing. First, it would accommodate a lot of the growing demand for multifamily housing in a walkable environment without disrupting stable single-family neighborhoods. These units would be the kind that are in demand in the current housing market, but are undersupplied. Transit. Major streets that receive a makeover like I am suggesting would be the ideal place for transit routes due to the high concentration of riders and destinations. Retail. It will do better on the major street, and the walkable urbanism that we are trying to create will benefit greatly from healthy retail. Sustainability. There would also be environmental benefits; people living along the major street would almost certainly walk, bike, and ride transit more often, and some people in the adjacent single-family homes may even begin walking to destinations on the major street on occasion. Also, infill development accommodated along these corridors is development not built over farmland and wildlife habitat. Neighborhood Amenities. People in the adjacent single-family home areas will be apprehensive at first, but ultimately would be great beneficiaries of such a strategy. They would be able to live in a single-family home, surrounded by single family homes, and yet could walk to a walkable urban street loaded with amenities. It really would be the best of both worlds for them. City Revenue. In addition to revenue from improved property values stemming from roadway improvements, the new dense and mixed use development will generate much more revenue for the municipal government than the old strip mall development did prior to the makeover. More Nice Places. Our cities are short on nice places. Any time that we can turn an unpleasant place into a nice place, we all win. So, while I dislike noisy stinky suburban arterials just as much as the next guy, I learned to stop worrying about it when I realized that retail will work better on busy streets, and that we can make them nice places. My suggestion is this: Don't hide from major streets, and don't pull your downtowns and neighborhood centers away from them. Calm them, improve them, and reap the benefits.